The Illumio Adaptive Security Platform® (ASP) secures the inside of any data center and cloud – running any form of compute – with micro-segmentation enabled by application dependency and vulnerability maps. 10% Discount off RRP to Marketplace Users: Crystal Eye Deployed Device that is a Unified Threat Management (UTM) next-generation firewall (ngfw) software/hardware solution for your enterprise or home office, protecting it from a variety of threats and risks through a range of integrated services. 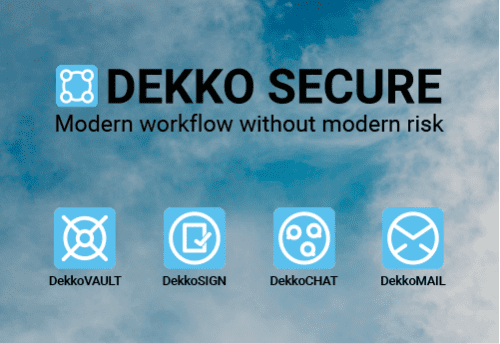 Dekko is a secure workflow platform for sensitive & confidential data exchange. Dekko reduces the risk and impact of data leaks and human weakness in organisational communication. End-to-end encryption and an audit-logged workflow removes the risks associated with sharing and approving sensitive documents online. The fourth annual event in a global series highlighting the digital transformation taking place across the industry and will allow attendees to learn from pioneering leaders in the field, showcase best practice and benchmark their approach with peers. Don’t miss out – enquire today! The Industrial IoT USA summit is brought to you by Qatalyst Global.